Art of the Book in California: Five Contemporary Presses: "From the outset, one of Ninja Press's primary mandate was to strive for the highest standards of excellence in craftsmanship and quality while attempting to find new approaches to the union between word, image, and book structure. That mission will continue to fuel the inspiration for future editions works, as well as one-of-a-kind books." Sherman Oaks, California: Ninja Press, 2017. 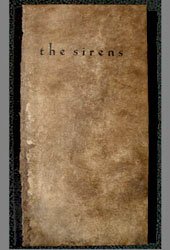 Edition of 75. 8.75 x 10.50; 36 pages. Letterpress printed in Meridien with Neuland for display on a Vandercook Universal I flatbed proof press. Printed on kitakata paper, handmade in Japan. Each text sheet folded at the foredge then painted by hand with walnut ink. Endsheets of kakishibu, a persimmon-washed, cinnamon-colored handmade Japanese paper. 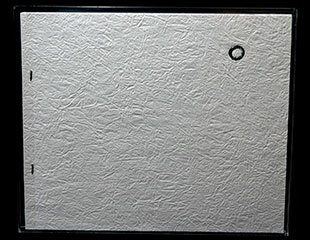 Bound in double layer of kyoseishi, handmade paper from Japan. Sewn using black silk thread exposed near the spine. Housed in a clear acrylic slipcase. 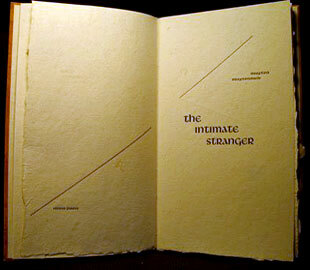 Design, presswork, painting, and binding by Carolee Campbell at Ninja Press. Numbered. Signed by the poet. UCSC NewsCenter, April 19, 2017: "In Japan is the title of an elegant new collection of poems from UCSC humanities lecturer and alumnus Gary Young … published by Ninja Press. "The poems were written while Young was in Japan working on a book of translations of the calligraphy of the Zen priest Kobun Chino Otogawa. During this time, he had the great honor of staying in the Hokyoji Zen Monastery, where he was given access to Zen Master Dogen’s original manuscripts, calligraphy, and other relics. "While traveling around Japan and working on the translations, Young also began to work on a series of original poems. "'This was only a few months after the earthquake and the Fukushima nuclear disaster,' Young noted. 'My poems reflect my joy at being in Japan, but there is an undercurrent of grief and loss throughout the collection.'" Ninja Press: "These previously unpublished prose poems resonate with unerring clarity and a streamlined diction honed over years spent enveloped in the misty redwood forest and streams of his home in the Santa Cruz Mountains of California. "Each faintly green text sheet is folded at the fore edge, then painted by hand with walnut ink. An enso (empty circle) inhabits each page and is printed in a second color. The enso is a brushed circular form common in Zen buddhist art representing the ultimate Zen theme suggesting both emptiness and completion. "The snow white cover is a double layer of kyoseishi which means 'strengthened paper.' This handmade paper from Japan is coated with konnyaku juice, a form of starch derived from the konjac plant, also known as devil's tongue, voodoo lily, or snake palm. Konnyaku juice gives added strength and impermeability to the paper. Strong, flexible, and water-resistant, historically it has been used to make clothing as well as paper. "A clear acrylic slipcase protects the book while revealing the cover, its sewing, and the foredge painting." Sherman Oaks, California: Ninja Press, 2015. Edition of 75 + 8 hors commerce. 12.5 x 6.75"; 36 pages. Handset Van Dijck with Felix Titling for the display. Printed letterpress on dampened Barcham Green paper, handmade in 1986 at the Hayle Mill (now closed) in Maidstone, Kent, England. Two watermarks throughout, one with date. Text printed on a Vandercook Universal I flatbed proof press. Photographs printed digitally by Karen Skove Chu using UltraChrome Ke inks on Japanese Asuka washi, then cut, and tipped in by hand. 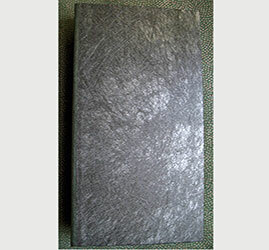 Bound quarter leather using a forest green French goatskin with black English paper over boards. 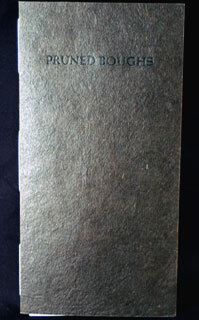 Text sewn into an inner cover of pure Belgian flax, handmade at Cave Paper in Minneapolis, Minnesota. Signed by both poet and photographer. Ninja Press: "This set of splendidly rich poems records the minutiae of the moment, moving from micro to macro throughout. The poems are both the residue of privacy and an accounting of terrain, the poet's territory; a collision of megalopolis, mountain, and desert meeting in fire. "Twenty-three photographs taken by Carolee Campbell inhabit the book. They do not illustrate as much as act as an ambient penumbra. The images were found in the glancing light shining off the edge of the poetry." Sherman Oaks, California: Ninja Press, 2011. Edition of 80 plus 8 lettered hors commerce. 10.5 x 5.25"; 28 pages. Signed by Alan Loney. Design, presswork, embellishment, and binding by Carolee Campbell whose photographs line both front and back boards. Prospectus: "Hand set in Eve and Paramount printed on gampi torinoko, handmade by the late Masao Seki on Shikoku Island, Japan. The decorative device repeated throughout the text is embellished by hand with gold and silver pigments, as is the titling. 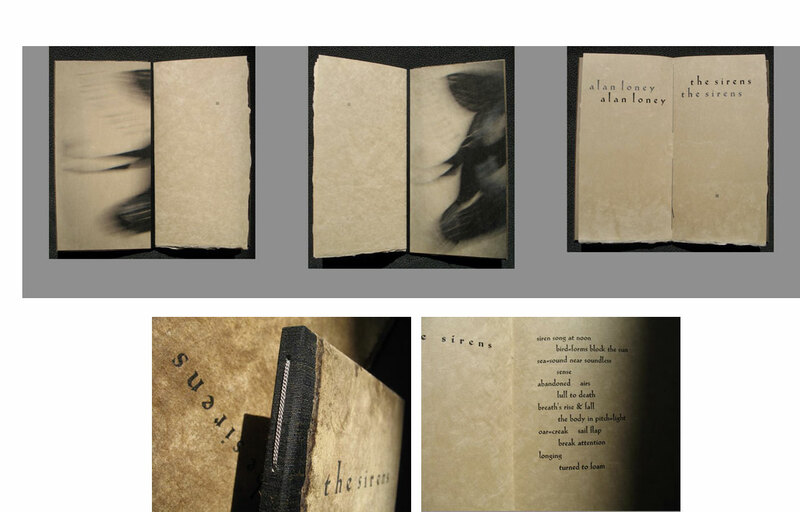 Text is sewn through the black Asahi cloth spine with gray silk cord echoing the silver embellishments. The boards are covered in hanji, handmade at the Jang Ji Bang papermill in Gapyeong, Korea. No two sheets are alike in their coarsely stained beauty. The desiccated effect of the paper provides a counterpoint to the silken interior sheets, evoking the terrible beauty of the mythic Sirens, their song and their silence." This Ninja Press publication consists of previously unpublished poems by Alan Loney, recipient of the 2011 Janet Frame Literary Trust Lifetime Achievement Award for poetry. Carolee Campbell: "It has been a distinct pleasure to get to know the poet, Alan Loney, if only by e-mail and it is my honor to have published this distinguished poet, printer, and man of indefatigable curiosity, intelligence, and grace." Sherman Oaks, California: Ninja Press, 2008. Edition of 100. 4.5 x 10"; 15 pages. The type is hand-set Meridien with Weiss Initials Series III for the display, printed letterpress in three colors onto dampened Frankfurt. A simple decorative device used throughout, printed and hand-brushed with iridescent mica, is from a punch cut by Carolee Campbell, then struck into a matrix by Theo Rehak. The cover is a walnut-stained flax sheet handmade by Bridget O'Malley at Cave Paper. Design, paperwork, and binding by the artist with assistance from Karen Skove Chu in the bindery. There are 100 numbered and signed copies in the edition with an additional 12 lettered hors commerce. Signed by the poet. Prospectus: "These previously unpublished poems is the third in a series of Ninja Press publications written by this generous and highly favored poet." Ninja Press: "With its rich walnut covers and stark white text, this slender volume brings into sharp relief the somber prospect invoked by these poems." Carolee Campbell: "Very pruned. Very chaste. Just the poems on the page." Sherman Oaks, California: Ninja Press, 2002. Edition of 135. 5" x 5", 38 pages. 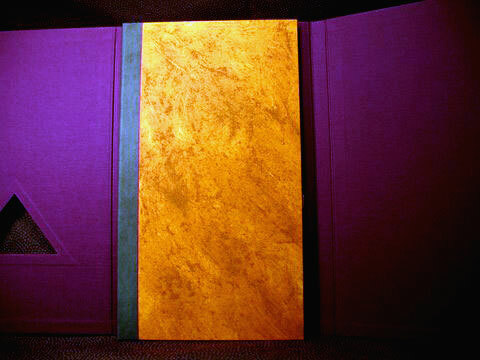 The book was designed, printed and bound by Campbell. This is a collection of poems written on the occasion of the poet's 25th wedding anniversary and offered as a gift to his wife. 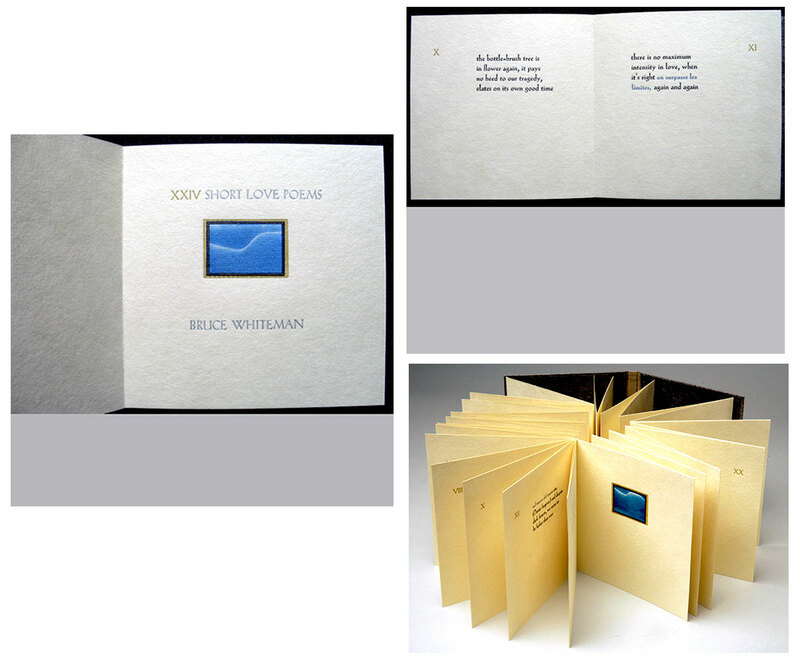 Printed letterpress in four colors, the text paper is Japanese hangashi, the poems are augmented by three cyanotypes, a 19th century photographic process which are sensitized by hand and printed on Velke Losiny paper by the photographer Carolee Campbell. The accordion style binding uses a luminous golden past paper, hand painted by Claire Maziarczyk. Together these elements create the impression of a silken coverlet under which the poem lies. Sherman Oaks, California: Ninja Press, 2007. Edition of 100. 13 x 7.5"; 40 pages. 100 numbered and signed copies with an additional 10 lettered hors commerce. The type is hand-set Samson and Libra printed letterpress on dampened flax paper handmade especially for this book by Bridget O’Malley at Cave Paper. A horoscope, as well as the multicolored signs and symbols seen throughout the text, are drawn by Carolee Campbell and printed from photopolymer plates. Additional symbols are applied by hand using pure earth pigments. The boards are covered in flax paper hand coated with a mixture of ochre pigment and fine volcanic pumice. 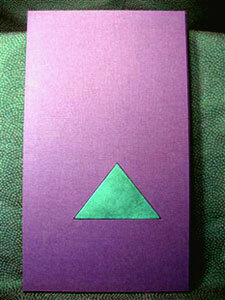 A second inner cover holds the text and is sewn into the spine with a thin purple silk cord. An additional hardcover enclosure, handmade by Judi Conant, protects the book and echoes the theme of the artwork using an artful locking device. A separate chapbook containing a legend for the text-inspired signs and symbols completes the edition. It is printed letterpress in eight colors with three additional pigments applied by hand. It is printed on dampened Nideggen in Samson and Libra and is sewn with silk into a flax paper cover. The design, presswork and binding are by Carolee Campbell at Ninja Press with the assistance of Karen Skove Chu in the bindery. In this single, long prose poem, every paragraph has been given its own page or double-page spread. Each of the thirty-two pages is embellished with signs and symbols printed in multiple colors which have been inspired by the text. Sherman Oaks, California: Ninja Press, 2009. Edition of 85. 14.25 x 9.25"; 48 pages. Type is handset Van Dijck with Weiss Initial Series I for the display and printed on dampened Domestic Etching on a Vandercook Universal I flatbed proof press. The folios are laid in a goat parchment cover. The skins were processed by hand. 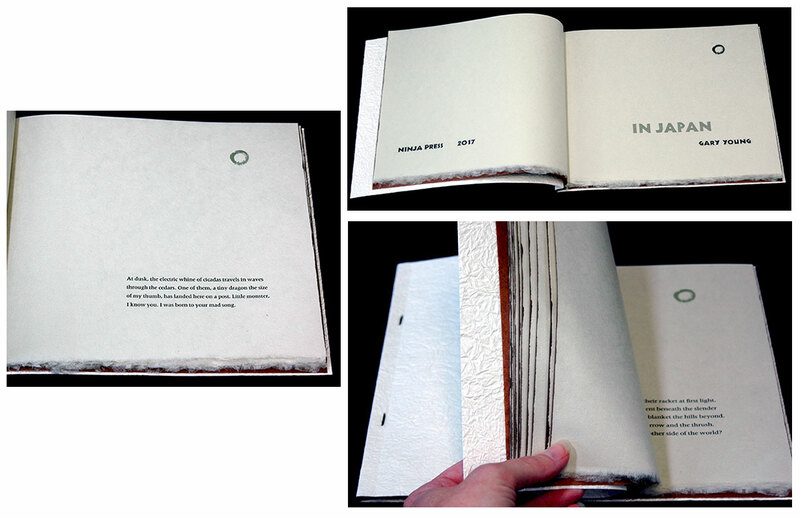 The book is protected by a hard-sided chemise wrapper covered in a deep green Asahi Japanese silken cloth. A slipcase is covered in natural colored linen. 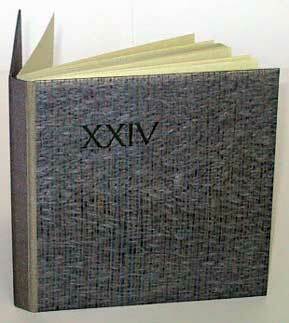 Text pages consist of twelve unbound folios which open to 14 x 18". Each folio is painted by hand on both front and back using sumi ink and salt by the artist — making each book unique. 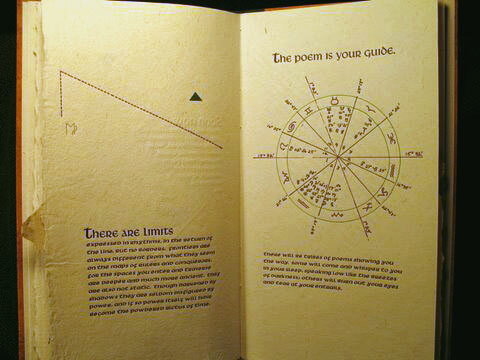 The poems are printed on and alongside the artwork. Prospectus: "The Persephones was first published by Christopher's Books in Santa Barbara, California in 1974. Much of the edition was subsequently destroyed by fire. 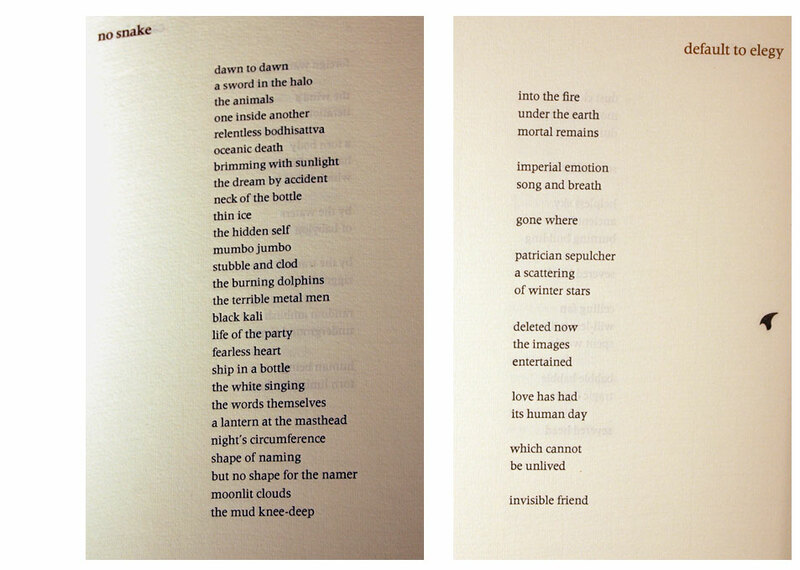 The poems were significantly altered in 2007 by the poet for this Ninja Press edition." 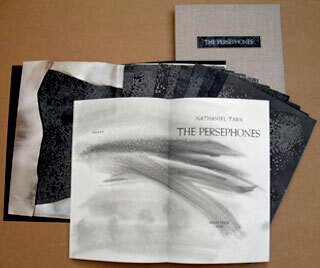 Maureen Davidson, Book as Medium: Holding/Withholding Text at UCSC Sesnon Gallery: "The Persephones, a folio by Carolee Campbell of Ninja Press, is an awe-inspiring tour de force, its hand-set press on dampened Domestic Etching paper, the cover of each folio hand-painted on both sides using sumi ink and salt in a sheet that summons galaxies, preciously revealing exquisite pages of poetry by Nathanial Tarn." Parenthesis 19, review: "Campbell's typographic treatment and book design are superb. 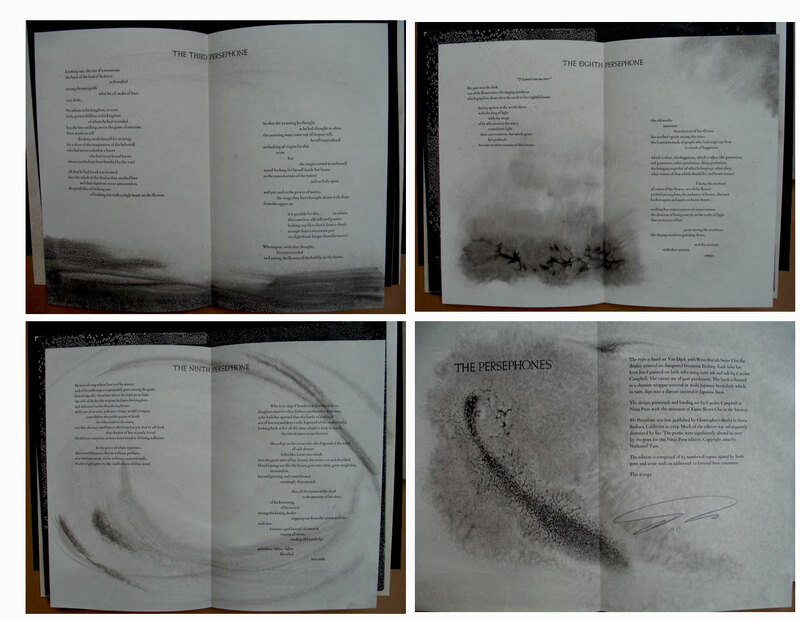 Each of the poems rests on an open spread decorated with broad strokes of sumi ink and salt - an illustration technique that gives an earthy, primitive look to the pages. Each treatment is appropriate and unique to the poem."